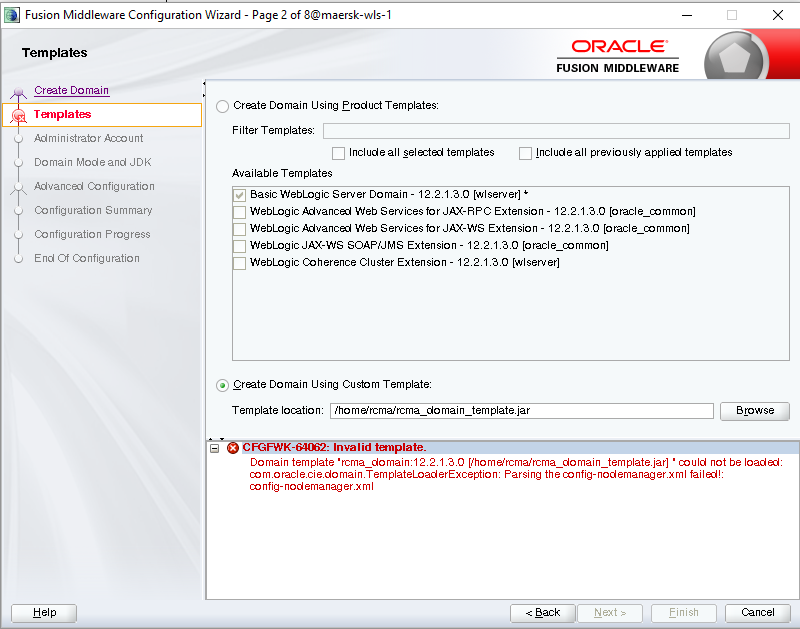 I am trying to configure a new domain based on a template for a working domain configuration that I created using Domain Template Builder (./Oracle_Home/oracle_common/common/bin/config_builder.sh), however the Configuration Wizard (./Oracle_Home/oracle_common/common/bin/config.sh) fails, reporting a failure prsding the config-nodemanager.xml file. I get the same error using WLST. Does WebLogic 12cR2 (12.2.1.3.0) require that Node Manager configuration be included in the template even if a Node Manager is not going to be used? This wasn't the behaviour with 12.1.3. 2018-03-31 12:16:17,091 INFO  com.oracle.cie.domain.info.variable.DomainVariableServiceImpl - initializing domaininformation object. 2018-03-31 12:16:17,376 INFO  com.oracle.cie.domain.info.variable.DomainVariableServiceImpl - initializing domaininformation object. 2018-03-31 12:16:53,657 SEVERE  com.oracle.cie.domain.WLSTemplateBuilder - config-nodemanager.xml: failed to parse the template! (/home/rcma/rcma_domain_template.jar): Parsing the config-nodemanager.xml failed! com.oracle.cie.domain.TemplateLoaderException: Parsing the config-nodemanager.xml failed! Caused by: weblogic.security.internal.encryption.EncryptionServiceException: com.rsa.jsafe.JSAFE_PaddingException: Invalid padding. Caused by: com.rsa.jsafe.JSAFE_PaddingException: Invalid padding. Caused by: com.oracle.cie.domain.TemplateLoaderException: Parsing the config-nodemanager.xml failed! This may happen when you have a wrong password for nodemanager. I never did get this resolved, but found that using the Pack and Unpack tools served my needs to package-up a domain configuration and install it on another machine. Weblogic9.2 Error message:Could not perform unpadding: invalid pad byte.